GDC 09 Nintendo president Satoru Iwata delivered a keynote address to a capacity crowd at the Game Developers Conference in San Francisco today, revealing a new mass storage solution for the Wii and preview of three upcoming game titles. Until now, the Wii was alone in the current generation of consoles to lack a proper mass storage infrastructure. While the Wii's internal 512MB storage was workable for game saves and a few downloads, downloading games on the Wii Shop Channel could quickly fill up the available space. 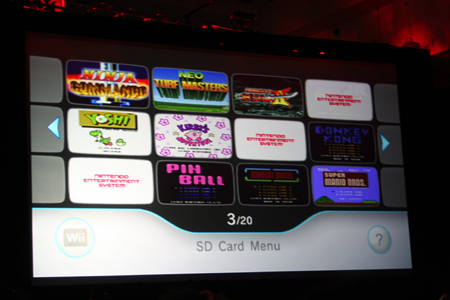 Announced and available today is the Wii System Menu 4.0. The update not only lets the console now recognize SDHC cards up to 32GB (up from a 2GB max), but virtual console games can now be saved and loaded directly from the cards. In addition, Iwata gave a very brief preview of a new Zelda title for the DS tentatively titled The Legend of Zelda: Spirit Tracks . 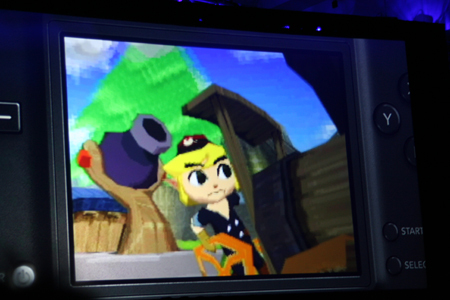 The game sports the same slick cartoony look as the previous Zelda DS entry, The Phantom Hourglass , this time apparently with Link conducting a train. Iwata said the title will be released later this year — although he didn't specify in which regions. Nintendo will release a new WiiWare game called Rock n' Roll Climber that uses a combination of the Wii controller and Wii Balance Board to simulate rock climbing. The rock n' roll angle is a bit flimsy as far as we could tell — after the player climbs the rock wall the character celebrates by shredding on a rather conveniently-located electric guitar at the top. Nintendo's WiiWare shop is also rolling out two new Final Fantasy games later this year. My Life as a Darklord: Final Fantasy Chronicles will be an evil-sided sequel to the WiiWare launch title, My Life as a King . The sequel to Final Fantasy IV which was previously available only for mobile phones, Final Fantasy IV: The After Years , is also coming to WiiWare. Starting in May in Japan, the first six classic Final Fantasy titles will be released to the Wii's Virtual Console. Iwata said those titles that were released overseas will be made available in the US Virtual Console service too. The theme of the keynote seemed to be inspiring and convincing independent developers to make games for the WiiWare store and for the DS. Iwata addressed a widespread industry perception that because Nintendo focuses so much money and development on first-party games, there's no point in trying to compete with the big N on its own consoles. Iwata said it was Nintendo's plan to pump out AAA titles for the consoles to help build the initial hardware install base. He said the mission has succeeded, and cited that 75 per cent of third-party Wii games have sold in excess of 1 million copies. He also brought up NPD numbers that claim the more third-party games were sold for the Wii than any other console. Nintendo's prez also gave developers at the show a glimpse into the development process of its keystone game maker, Shigeru Miyamoto. He said Miyamoto controls many small development teams that work on prototypes and game concepts. It's only after the game is promoted to the production stage that Iwata will ask Miyomoto about timeframes for release. Iwata said Miyamoto comes up with game concepts by observing and deconstructing how people have fun — and gets more than a few game ideas from the hobbies he takes up. For instance, when Miyamoto was into gardening, he came up with Pikmin . When he got a new puppy, that was the inspiration for Nintendogs . Iwata joked that it happens so often, he included Miyamoto's current hobbies as a part of his nondisclosure contract. "I have asked him not to talk about his hobbies when he's not at work," Iwata said. "His non-disclosure is 24/7." 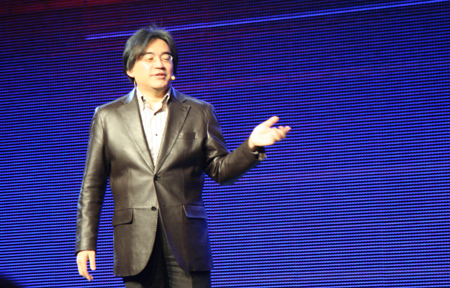 Iwata also thanked the attending developers for their hard work supporting Nintendo over the years.